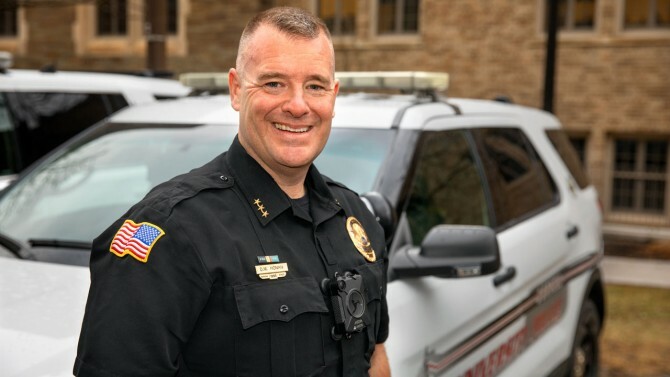 The Cornell University Police department is an internationally accredited organization that operates 24 hours a day, 365 days a year, from its headquarters in Barton Hall. The department has 68 members, 43 of them sworn officers who patrol campus on foot, in vehicles, on bicycles, and with explosive detection K-9s. The mission of Cornell Police is to protect lives and property, maintain order, prevent crimes, receive and investigate reports of crimes, and provide other law-enforcement services. The department is responsive to the special needs of Cornell’s large and diverse community—a community of people who come from across the United States and the world to study and work at Cornell. The Cornell University Police Department serves as the vital link between those in need and many resources both on and off campus. Our staff consists of highly trained, certified law enforcement officers supported by an outstanding group of civilian employees, making our department one of the finest internationally accredited law enforcement agencies in the country. I am proud to lead this group of dedicated professionals who are committed to providing a safe and secure environment for our students, faculty, staff, and visitors. You will hear from me occasionally on various matters. As required by federal law, you can expect to receive an email from me when a serious campus crime occurs that represents a threat to the campus community. Throughout the year, I send you informative “Blue Light” messages to keep you informed and to offer suggestions for improving your personal safety. Everyone wants a positive experience at Cornell. Pledging to act sensibly, honestly, and with an attitude of mutual respect means that your time spent at Cornell will be productive and enjoyable. Please call us whenever you see anything suspicious, feel threatened, have a safety concern, or simply see a need for expanded police services to meet our community’s needs. We encourage all members of the campus community to take part in developing their own personal safety plans and strive to develop partnerships with Cornell students, faculty, and staff members. Hoping your time with us is a positive educational experience!